eBay The h21Tactical Professional 14-in-1 Survival Kit was uniquely designed and developed by our experts to keep you safe and prepared in any situation. Our professional team that includes: veterans, law enforcement, and outdoor survivalists have curated the perfect compact everyday carry kit that you can take on any adventure. Experts agreed that having access to the right tool at the right time could be the catalyst in ensuring their safety and the safety of their loved ones. We have curated each high quality item in this kit to cover the widest range of possible scenarios. We are able to pack this all in one kit into an ultra compact, water proof, and durable case to carry with ease that is a bit larger than a smartphone. 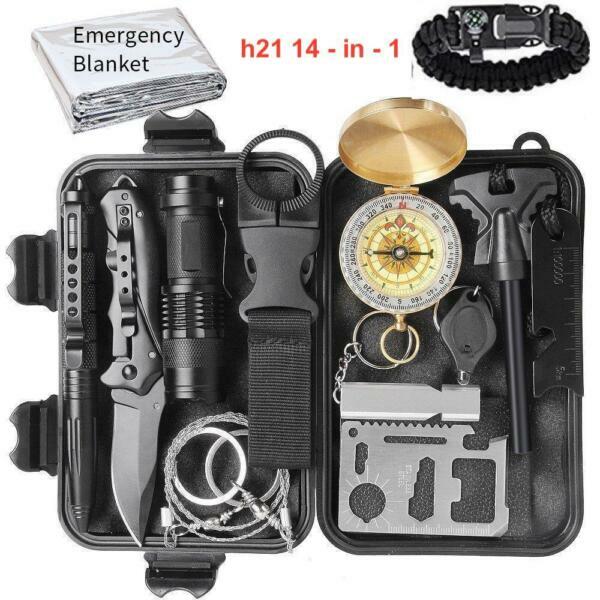 Our kit is discreet and packed well to be thrown into your car, backpack, drawer, or store in any small space that can quickly be accessible.✔ INCLUDES - 7-in-1 Para-cord Bracelet, Tactical Pen, Emergency Blanket, Whistle, Upgraded Compass, Folding Knife, Wire-saw, Card multi-tool, Striker/ Flint stone, LED Keychain light, Bottle Clip, Tactical Flashlight, Shockproof case.✔ ALWAYS EQUIPPED AND PREPARED – Having the right tools in the right situation can greatly improve your chances of survival, this kit will give that advantage in almost any situation.✔ COMPACT – Just inches bigger and thicker than smartphones. Convenient enough to be thrown in your desk drawer, glove compartment of your car, even in your back-packing or bug-out-bag.✔ PERFECT GIFT – This is the perfect gift for loved ones that spend time outdoors, hiking, climbing, camping, or just something to keep in their cars just in case. Friends and family will absolutely love this kit!✔ LIFETIME WARRANTY – Stringent testing and quality control goes into sourcing our products, we stand by our products 100% and guarantee you will love it or your money back. You are our #1 Priority and will do anything to keep completely happy with your purchase.SERIOUS BUYERS ONLY PLEASE!Please feel free to ask any questions.ITEM SHIPS FREE FROM USA PRIORITY!! !